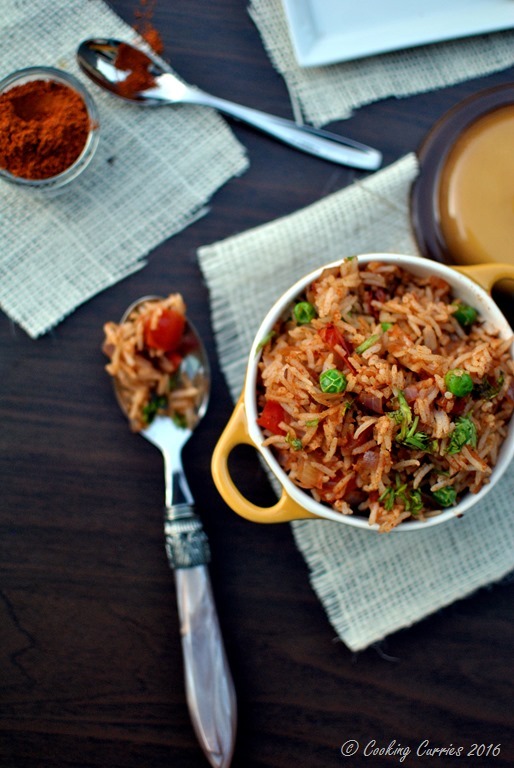 A vibrant Indian Street Food rice dish, that has fragrant basmati rice mixed with spice mixes and lots of vegetables. This can make a complete meal in itself, if you put together some raita or just plain yogurt and some crisped up pappadam. Its gluten free and vegan too! Rice has always been a comfort food for me. I am sure you would have heard more about naan and chapatis associated with Indian food than rice. It is true to a certain extent, the regional variation being the reason. In the Southern parts of India, rice and various different kinds of breads made with rice is more of a staple than naan or chapatis. Growing up those were a treat! It was on one of those rare weeknight dinners or a weekend lunch that the chapati showed up at our table. Amma found it a lot easier to make some rice or dosas or idlis than making the dough for the rotis and rolling them out and then cooking them. 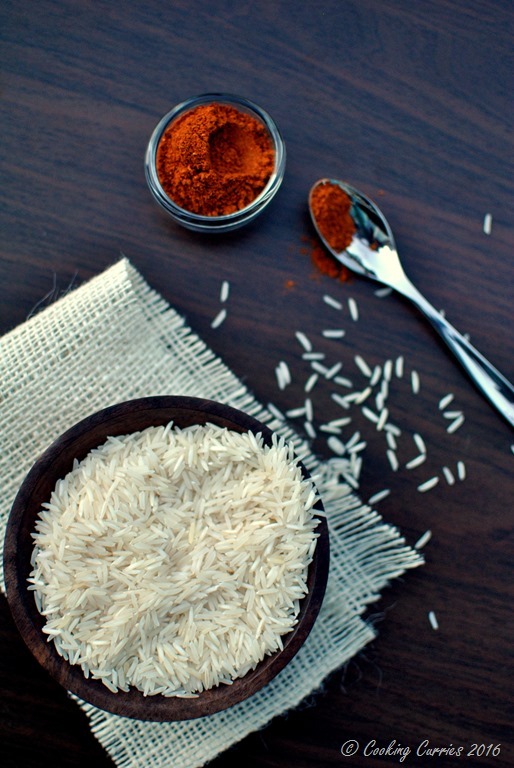 The variations in rice recipes were also very different from what you find in the Northern Indian cuisine. 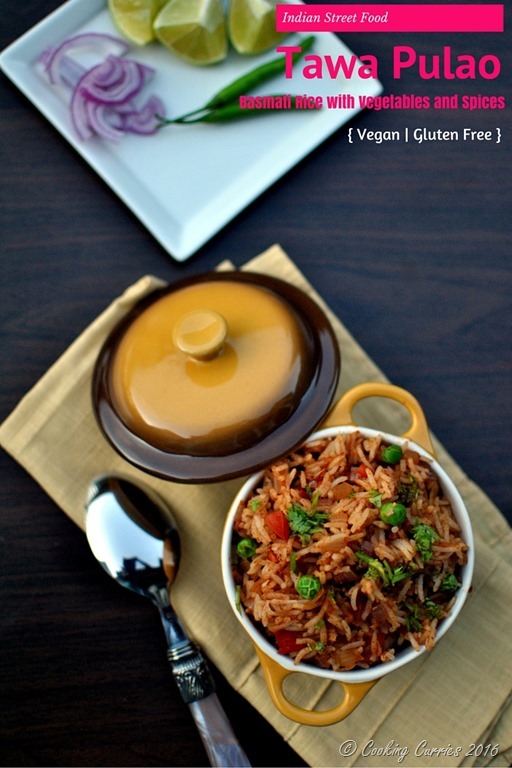 While most Indian food use real fresh ingredients in them and packaged food rarely find their way in, Southern Indian rice recipes are usually made with simple ingredients – like lemon rice ( turmeric+lemon) or tomato rice ( onions+tomatoes+ cilantro) or curd/yogurt rice (yogurt + chillies+curry leaves) as opposed to the pulaos which has a lot more spices added to it to give a depth of flavor to it. I love both kinds. I usually go for the lemon rice or tomato rice when I want comfort food and the pulaos and rich biryanis when I am looking for something more richer and celebratory. Will you believe me if I said I did not know about something called Tawa Pulao till like a couple of years ago?!? I seriously did not! And the day I discovered this I just loved it! But then again I did not know that Pav Bhaji masala was what went into this. I very recently discovered that and ventured out to make this. It is super super simple to make and I wish I knew about this much earlier! Note: Pav Bhaji masala is the spice mix that goes into making the mixed vegetable curry which is eaten with buttered pav/bun/bread (like dinner rolls). It is a very popular Indian street food. This is one of those recipes that fall somewhere in between being a simple comfort food and a little richer vibrant food. I love it for that. It is also very simple to make, if you can get hold of the pav bhaji masala. If not, you can still make a close yet still tasty version of it with just garam masala. Crushed garlic – 1 tbsp. Crushed ginger – 1 tsp. Red Chili powder / Cayenne powder – 1 tsp. Heat the oil in a large pan and add the cumin seeds. Wait till they are aromatic and splutter a little. Add the ginger and garlic, give it a swirl and add the onions to it. Let the onions brown a little. Add the green chilies, turmeric powder, red chili powder and pav bhaji masala. Sauté for a while. Add the tomatoes to this mix. Sauté till the tomatoes get cooked. Now add the carrots and bell peppers to it. Sprinkle a little water and close the pan to help cook the carrots. Once they are cooked, add the green peas, salt and the rice and mix well. Sprinkle a little chopped cilantro on top for garnish and serve with more chopped cilantro, chopped onions and slices/juice from 2 limes. 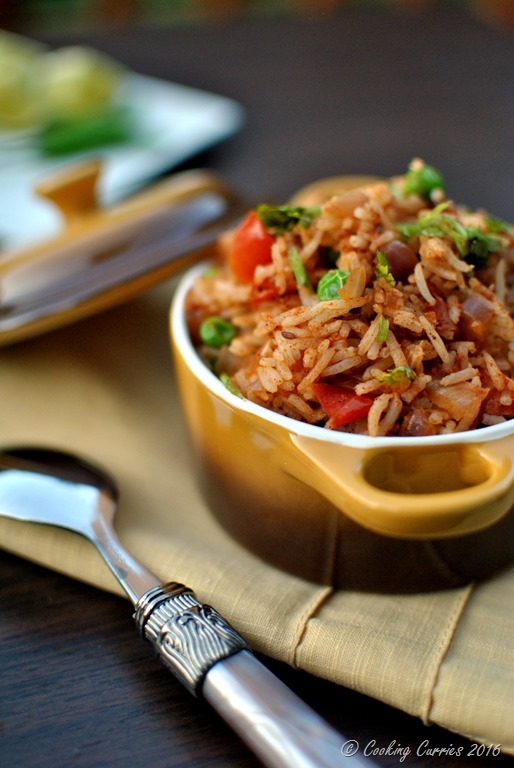 A vibrant Indian Street Food rice dish, that has the fragrant basmati rice mixed with spice mixes and lots of vegetables. This can make a complete meal in itself, if you put together some raita or just plain yogurt and some crisped up pappadam. Its gluten free and vegan too! I just love all the flavors you get! This is delicious! I love rice dishes. My hubby doesn’t like potatoes so we eat a lot of rice. I’ll have to try this. It sounds delicious! Beautiful photos too! I love different types of Pulao. This versions sounds delicious! Beautiful pictures! I could see just eating this with a spoon straight from the pot. Looks delicious! im horrible at making rice in a pot…its always rice cooker, so im very much in love with this version to challenge myself. So many wonderful flavours! It looks delicious. I love the simplicity of street food type recipes. I just love the sound and look of this! I’m a big fan of Indian food and I could eat this all day. Rice is definitely a comfort food for me, as well. And I love the spices and flavors of Indian food! Yum! 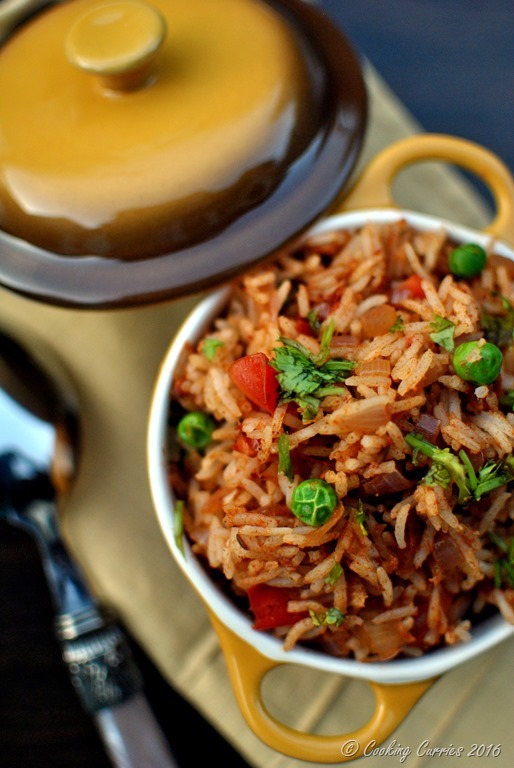 We make pulao so often but our recipe is always different. Your recipe looks so delicious. So happy to see that you used peas in it. Thank you Rahila! Glad you loved it!?? Very nice flavor I was looking for this recipe for long. I first tasted in the streets of Mumbai It was delicious. Your recipe refreshed our taste. Very good recipe.